Houses & Homes VA: Are Your Hard to Open Casement Windows Making You “Cranky”? Are Your Hard to Open Casement Windows Making You “Cranky”? Many homes have one or more casement windows (that’s the kind that “crank” open and closed) that are very hard to use. For some reason they are stiff and require a lot of strength to operate. Discovering what is causing the problem and correcting it is usually pretty simple once you what to look for. Step 1 is to simply check for loose screws. 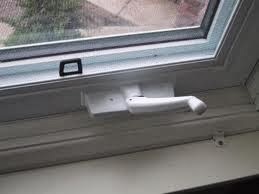 This is the most common cause for hard to operate casement windows. If you find that you have loose, rusted, stripped or missing screws that may be the problem. These types of windows need to be perfectly “square” in order to operate smoothly and must be held tightly in place by ALL of the screws. Just a few screws missing or holding tightly can cause problems. If the screws don’t seem to be the problem, check the hinges next. Again it is vital that all screws are in place and working properly. In addition you need to check the hinges to make sure they are “tight” and there is no “play” in them. If they “wiggle” when you open or close the window or seem loose, that is definitely the problem. If this is the case your best bet is to replace them with new hinges. Provided that screws and hinges are not what is causing the window to be “stiff” a good possibility is that your window is not “square”. This condition occurs either because they were not installed properly in the first place or the house has “settled” over the years and the windows are no longer perfectly square; they have moved a bit and are slightly “crooked”. Re-squaring a window usually takes a professional but if you are good with a T square you could attempt to repair the window by relocating the hinges. If you’re not 100% sure how to do this, I would definitely recommend a professional. Sometimes there is a possibility that the “operator” (the crank mechanism) has worn out. This can be caused by normal wear and tear over the years but normally if the gears in the operator are stripping the cause is one of the problems that we mentioned above. Obviously if the operator needs replacement you’ll need to do it but if you don’t fix what caused the problem in the first place you’ll be wasting your money. Be sure to check and correct the first 3 items before replacing the operator (if necessary). To inspect the operator you’ll need to remove the cover. This is usually done by loosening the crank handle setscrew but either way it shouldn’t be hard to do. Use the crank handle without the cover so that you can actually see the gears turning as you crank the handle. If you see grey colored dust or missing teeth in the gears than it is definitely time for replacement parts. If everything looks fine than all you should need to do is apply a little lithium grease to the gears and you’re good to go!